Foreign Affairs – The World Health Organization was established in 1948 as a specialized agency of the United Nations charged with improving global public health, coordinating the international response to epidemics, and the like. In the ensuing decades, its dedicated staff has served on the frontlines of public health battles, from the eradication of smallpox to the fight against AIDs to the challenges of noncommunicable diseases. 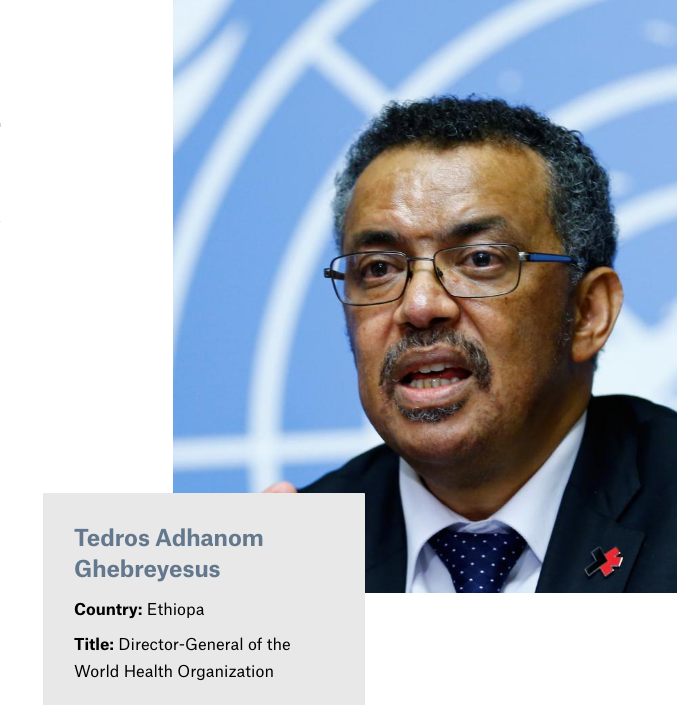 In May, the WHO’s member countries elected Tedros Adhanom Ghebreyesus as its new director general. A malaria researcher, Tedros, as he is known, served as the health minister of Ethiopia from 2005 to 2012 and as foreign minister from 2012 to 2016. He spoke with Foreign Affairs’ deputy managing editor Stuart Reid in New York in July. Epidemics or pandemics. Immediately after the First World War, in 1918, the world encountered the Spanish flu. It was airborne and killed more than 50 million people. Ebola is lousy compared to that. That sometimes keeps me awake at night, because we have to do a lot, especially considering the serious gaps we have. I think the world should unite and focus on strong health systems to prepare the whole world to prevent epidemics—or if there is an outbreak, to manage it quickly—because viruses don’t respect borders, and they don’t need visas. What do you see as the WHO’s core mission? The WHO has a responsibility to prevent, early-detect, and manage outbreaks, and it can do this by strengthening countries’ capacity. But we have to do more. Ebola has already shown the weaknesses that we have. So the WHO should start by strengthening epidemiological surveillance and investing in countries’ health systems. Viruses don’t respect borders, and they don’t need visas. You’ve identified health coverage as one of your top priorities. What does that mean in practice? About a third of countries are covered, a third are progressing towards universal health coverage, and the last third haven’t started. We will focus on speeding up the progress of those who are making progress and influencing those who haven’t started. The aim of the SDGs [the UN’s Sustainable Development Goals] is to leave no one behind by 2030. Political commitment is very important here. Expanding health coverage is not a technical issue but a political one; it should be seen as a right and a means to development. What role does the WHO have when it comes to noncommunicable diseases? First of all, it’s important to recognize that noncommunicable diseases are on the increase globally, both in developing countries and in the developed world, due to urbanization and changing lifestyles. We know many noncommunicable diseases are related to risk factors such as smoking, alcohol consumption, inactivity, and diet. We can address them by building or strengthening health systems focused on prevention and health promotion. Primary health care is especially important. Using the media is important. And in the education sector, it’s important to, as part of the curriculum, educate children on risk factors and help them choose a healthy lifestyle. Another threat to public health is irrational beliefs. In some of the richest communities, parents don’t vaccinate their children because they falsely believe vaccines cause autism. What can be done about the spread of misinformation? Governments have to communicate well with the community, and the WHO can help. In addition to that, we have to use the media. The media is very important on this. And we can use faith-based organizations and civil society to teach the society to accept vaccination as an important part of child development. Resources—both attention and money—are finite. Is there anything the WHO does now that it should not be in the business of doing? Of course, the WHO should prioritize. I’ve said we need to focus on universal health coverage, emergency response, women and children in adolescence, and climate change and health. So anything outside this will be less of a priority and get fewer resources. You’ve also said that you want to professionalize the WHO’s fundraising operations. But how can the WHO get more funding from countries when officials in those countries often can’t get the resources they need to run their own health ministries properly? I think the WHO in this case is shy. The WHO only contacts ministries of health, but it should also work with other ministries, like the ministry of finance, the ministry of foreign affairs—even heads of state and government. The WHO should play its technical leadership role but at the same time its political leadership role. If you say, “health for all,” it’s political. And unless you take it to the highest level possible, it cannot happen. What do you plan to do to increase the funds available to the WHO from governments and private groups that are not earmarked for specific projects? Take those earmarked for polio. Seventy-four percent of your employees in Africa get their salaries from polio funds. We’re now on the verge of eradicating polio, but after the eradication of smallpox—arguably the WHO’s greatest success—the infrastructure and funding sources used in that effort fell apart. How do you make sure that doesn’t happen again? We should be creating value for money—using all the available money wisely. We should expand the donor base. We need to look for new donors apart from the traditional donors, not only governments but foundations and the private sector, as well. We should ask for flexible funding rather than earmarked funding. We also need to strengthen our resource-mobilization capacity. If we can address these key areas, then we can reduce our dependency on earmarked funding. For polio, we have already developed an exit strategy. But donors might walk away after victory is declared. What rationale would you give to, say, the Rotary Club, to keep giving money to the WHO? Or to the Bill and Melinda Gates Foundation? Polio is being finished, but there are other areas that need a joint effort. The same children saved from polio will need support for other health problems—could be measles, malaria, or other problems. Another relevant nonstate actor is the pharmaceutical industry. Some have criticized its priorities—for instance, producing drugs for restless leg syndromewhile tuberculosis still kills more than a million people every year. Should more pressure be placed on the industry? The private sector will always go for profits. If you put pressure on [companies not to do this], I don’t think they will succumb. It doesn’t work that way. They should see in their business plan whether or not they can get funding, so one area to consider is what Gavi [the Vaccine Alliance] does, with an advance market commitment that helps pharmaceutical companies invest in vaccines that are only important for the developing world. The other option is for governments to invest, because it’s a public good. Many feel that the WHO responded too slowly to the 2014–15 Ebola outbreak. How can it respond faster in the next emergency? My predecessor, Dr. Margaret Chan, worked on reforming emergency response, and a new program for it is now in place. One good experience with using the new system is the recent report of Ebola from the DRC [Democratic Republic of the Congo]. It was detected early and reported immediately, and the country mobilized partners and addressed it. We need to make the program even stronger, and we should build it up with a sense of urgency. We have learned a lot from Ebola. We have to implement those lessons aggressively. Some also feel that the WHO has been too accommodating of governments. Is that accurate? I don’t agree that the WHO only follows what the members states say. It goes both ways. Member states should listen to what the WHO says, and at the same time, the WHO should listen to them. But sometimes a government may not want to raise the alarm about an outbreak because it fears a drop in tourism. What can be done in cases like that? On that one, it’s not an issue between the WHO and the member state in question; it’s about the overall implementation of the International Health Regulations [the rules that govern how states respond to outbreaks]. That involves not only the country in question but other countries, as well. For instance, a country may fear the impact on the economy if it reports a certain disease. And if the other countries, instead of banning travel or other measures, could be supportive and implement the IHR, then the country could be encouraged to report immediately. Tedros at the World Health Assembly in Geneva, May 2017. What were your biggest accomplishments and challenges during your time as Ethiopia’shealth minister and foreign minister? Our biggest achievement was health-sector reform. The success was in making sure that primary health care was the center of gravity in our health system. People prefer to focus on building hospitals and so on, so it was difficult to convince many to accept primary health care as a priority. Ethiopia achieved most of the MDGs [the UN’s Millennium Development Goals] because it focused on health promotion and prevention. You said earlier that the media is crucial to the spread of public health information. According to the Committee to Protect Journalists, in 2016, Ethiopia imprisoned 16 journalists, making it one of the five worst countries in the world in terms of jailing reporters. This interview is of me representing the WHO. So do you think it’s a good idea to talk about [something] country specific? It’s unrelated to the job I’m doing now. What is your response to people who say that in your current role, your association with the Ethiopian government could undermine your work? It’s not related, but I can answer. First of all, when I was there, as far as I know, journalists were not jailed because they spoke their mind. It was because they trespassed. We have rules and laws, like any country. Journalists may or may not like a particular law, including in the U.S., but even if you don’t like a law, you don’t break it. That was the problem. Otherwise, the media is actually important. It’s the eyes and ears of the society. And the government uses this as feedback to intervene where there are problems, and that’s how we used to see it when I was part of the government. But be it a journalist or a politician or a businessman, no one can be above the law, because if you do that, it’s very difficult to govern a country. Critics have also accused you of covering up cholera epidemics in Ethiopia. Neighboring countries have tens of thousands of cases, and experts say that Ethiopia is currently suffering from an outbreak. Why not just admit it? I think you have read in The New York Times what Tom Frieden [the former director of the Centers for Disease Control and Prevention] said [in a letter to the editor responding to an article about the allegations]. It doesn’t even make any difference whether you call it “cholera,” because the management is the same. The most important thing is to respond immediately. You’re the first African head of the WHO. Should developing countries get a greater voice in global institutions more generally? I think any position in any international organization should be merit-based. When I competed, that was my platform. It’s not about developing or developed world; it’s about selecting the right people for the position, and there are many able people from the developing world who can run organizations. By the way, the UN has been run by Africans before: Kofi Annan and Boutros Boutros-Ghali. The World Bank has been getting increasingly involved in public health, not just in funding but also in directing policy—developing its own guidelines for universal health coverage, for instance. Shouldn’t that fall under the WHO’s mandate? The global challenges we are facing are getting more complex, so having more players is not a problem. I don’t think the WHO should compete with the World Bank, and the World Bank doesn’t need to compete with the WHO. We can work together. On many of the things that the WHO does, if the World Bank has a competitive advantage, the WHO should let the World Bank do it. If the Global Fund [to Fight AIDs, Tuberculosis and Malaria] has a better comparative advantage, the Global Fund can do it, or Gavi can do it. At the end of the day, the important thing is building effective partnerships to achieve our global health objectives. U.S. President Donald Trump’s proposed budget cuts include a 17 percent decrease for the Centers for Disease Control and Prevention and an 18 percent cut for the National Institutes of Health. What would that mean for global public health? That’s not yet finalized. The United States normally takes a bipartisan position on these issues. I expect that the U.S. will contribute its share.